In a cozy backyard in Jamaica Plain, Cheese Boys, an all-female folk band, played their set illuminated by Christmas lights and camera flashes—all surrounded by student artwork. The dreamy setting and accompanying artwork kicked off Pink Taco’s Sensitive Soiree, an event showcasing 14 Emerson storytellers, filmmakers, musicians, and more, to celebrate those who identify within the female spectrum and their art. “It’s what you create for yourself in your bedroom,” she explained. Krigsfeld, a junior political communications major, and her co-founders created the organization originally as a zine but expanded the idea into an inclusive online publication. “We wanted to create a safe space to make female-identifying artists and writers share their pieces,” Krigsfeld said. Junior Stephany Christie, a former Beacon assistant lifestyle editor, a journalism major, and a Pink Taco co-founder, said she noticed many people create artwork outside of the classroom. Pink Taco accepts all submissions relating to the female experience and posts them to their website, http://www.pinktaco4ever.com. With the inclusive goal of the publication, Christie said, the most effective way to begin was to create a virtual space. “We decided to put it online because it’s the easiest and cheapest way, especially for people to submit their work and for a broad group of people to be able to see everyone’s talents,” Christie said. While the online nature of the publication is something the creators aren’t planning on throwing away anytime soon, the idea to make the space into a physical reality returned as the fall semester began. “Open mic is the first attempt of making the space not cyber and something people can come to,” Krigsfeld said. The event showcased the artistic talent of students who might not otherwise share their artwork. Roughly 50 guests showed up to experience the outdoor open mic and screenings, and view the paintings, photographs, and other prints that lined the hallways. Pink Taco isn’t an SGA-recognized organization, but the publication doesn’t particularly want to be. 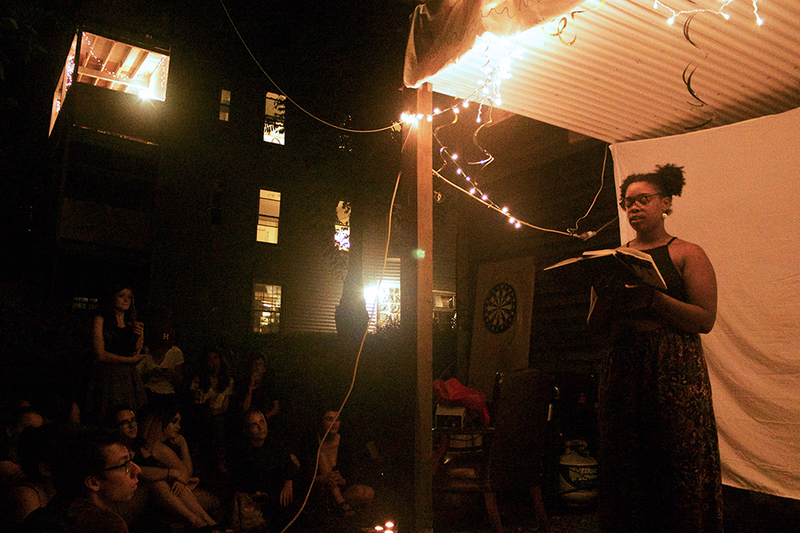 Their decision to host their open mic outside of campus was an intentional one. “We don’t want it to be Emerson-affiliated because we want it to be a community that everyone can join, not just Emerson students,” Krigsfeld said. The website features work from both Emerson students and the work of Krigsfeld’s friends. “We want it to expand outside of Emerson, and so that, when we graduate, we can still continue Pink Taco as a community for everyone,” Krigsfeld said. Tori Hawks-Ladd, a junior visual and media arts major and a Beacon film and television columnist, questioned the inclusivity of the publication on the event page. Krigsfeld said they purposefully made the definition vague in hopes to allow inclusion for all. Despite a slight hiccup involving sleepy neighbors concerned with the noise, Christie believes the soiree went smoothly. “Everyone who wanted to performed, and even those who were nervous beforehand, left with a smile on their face,” Christie said.